An urban landscape is defined not only by buildings and squares and streets, but also by the people who inhabit and pass through them, their vehicles and equipment and merchandise, and the ephemeral traces they leave behind in the form of signs, graffiti, and posters. 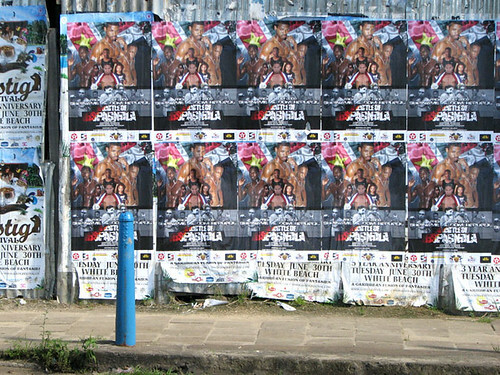 Walking around Paramaribo, I noticed there were specific locations — the walls of abandoned buildings, temporary fences and hoardings — where event promoters advertise their parties, concerts, or sports tournaments, sticking up posters in overlapping dozens or even scores to achieve maximum visibility. 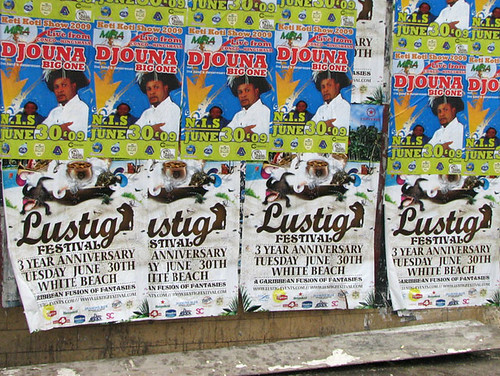 In late June 2009, three events dominated this urban wallpaper: a "Battle of Hispagnola" boxing tournament, pitting Surinamese fighters against a team from the Dominican Republic; a concert by the visiting Congolese performer Djouna "Big One" Mumbafu; and the Lustig Festival, a big party organised by private promoters at a river beach inland from Paramaribo. Of the three, the Lustig Festival posters were the most arrestingly surreal. They emphasised the white sand of the beach location, and the event's tagline — "A Caribbean Fusion of Fantasies" — achieved visual form in a montage of stock photos. A flamingo, an alligator, three pots of gold, a monkey, colourful tree frogs, a bottle of Champagne, a toucan, and a young woman with Latin features — wearing a tiny bikini — burst forth from a pirate's treasure chest. You could write a whole dissertation on what this assemblage of images in this context says about Suriname's relationship to the Caribbean, or to ideas of "Caribbeanness". 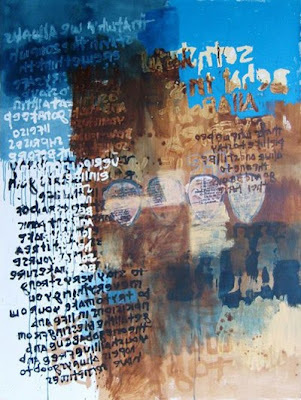 Ravi Rajcoomar's recent paintings, with their bold colours, graphic deployment of text, stencilled silhouettes, and palimpsestic collages, make explicit reference to street posters, graffiti, and the accidental, evolving "murals" created by layers of paint, paper, and glue on Paramaribo's urban surfaces. Their mirror-reversed text fragments and ambiguously gesturing human figures suggest stymied communication: a dream diary, a narrative without a key, a map missing its legend. He writes that these works explore "the mystery, the unknown, the untold, the unspoken, and the unsaid" of human interaction. More immediately and subtly than a traditional topographical view — a rendering of a picturesque building or bustling market scene — Rajcoomar's paintings record the city of Paramaribo, close up and at street level. Words depicted as graphic forms overlap like voices from a crowd. 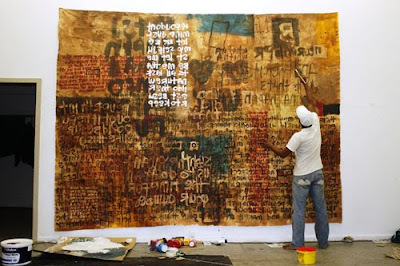 Chaos plays against order, energy against melancholy, as in urban landscapes anywhere in the world, but letterforms hinting at Afaka script ground these works in Suriname, in Paramaribo. See more of Rajcoomar's recent works at his website. And not only is graffiti a trace of what we leave behind, it is an undermining of that which leaves us behind; of hegemonic structures which literally rise around us. It is an undermining of these structures. It flourishes at the marginal spaces of an urban landscape in a way that takes those spaces and presents them as a direct challenge to all around. There is also something about graffiti that is very in tune with our inner selves. As children, graffiti tends to be one of the first of many challenges to the world around us that we engage in. We scrawl on walls with crayons and pencils to the chagrin of our parents. To repeat the exercise throughout life and at a larger scale taps into a process of endless individuation. This is cool.